Best Price Guarantee. Call us� our price on this item will not be beaten. If you need massive amounts of garlic peeled in a hurry, this Skyfood large scale electric garlic peeler (model DAL-6) is for you. A commercial grade garlic peeler, it runs on a .25-HP motor and peels up to 9 pounds of garlic at a time. The whole garlic bUlbs must first be divided into separate cloves; this machine strips the reddish skins from the yellow garlic cloves. Imagine how long it would take you to peel nine pounds of garlic cloves - this machine does it in about five minutes; your hourly production will be approximately 106 pounds. The basic device is simply a rotating canister; the peels are stripped off the cloves by friction as they tumble against the bottom-mounted peeling disc and as they rub together inside the canister while a jet of rinsing water pours in. The tabletop design permits easy sink drainage of the rinse water; after that the cloves are clean and peeled and are ready for chopping, saut�ing and frying. This user-friendly high volume commercial garlic peeler is simple to use and easy to clean and maintain. 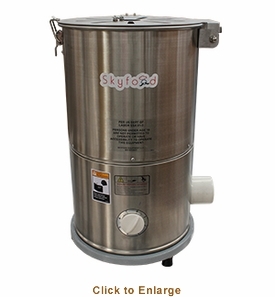 It has been designed for the large scale food prep tasks common to busy commercial kitchens. 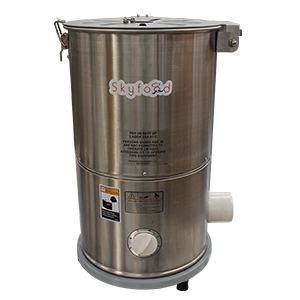 Note: Skyfood is the new name for the company previously known by the name Fleetwood by Skymsen. Manufacturer's Warranty: 1 (one) year parts and labor valid in the Continental United States.